Recently, I took the plunge. I downloaded the free version of Grammarly. A software program that corrects grammar, spelling, punctuation and sentence structure. The free version catches my often overlooked typos. My family moved a few weeks into my sophomore year and beginning typing. Therefore, my typing skills are less than stellar. Thanks to the invention of the personal computer I am now able to fix my typos quickly. However, there are still other things I can miss. Grammarly catches those. It underlines the word in question and shows me in a sidebar the problem. Or in some cases the assumed problem. The program pinged on the word Wok—asking if I might mean walk. Because I was referring to the pan, I choose the ignore button. When it questioned the spelling of neighbor to be corrected as neighbour, I again hit ignore. I didn’t want the British spelling. Most of the time it catches not only misspelled words (my bad typing) but improperly used words, missing articles, etc. Pretty cool. When the software challenges a word, I have found myself coming up with an even better word than the one cited as a possible error. Great way to stretch your creative juices. A downside, you have to get out of the program to save your corrections. I ran the spell check in Word as a double check. They disagree on a few things. Words spell check doesn’t come close to catching what Grammarly does, and its limited vocabulary pings errors that aren’t. Writers still need to do the work. Grammarly doesn’t replace working hard at crafting good sentences. Nor should it be used as the lazy man’s final draft. My college son relies on it to proof his work. Yes, he admits it’s the lazy way. But as writers, we still need critique partners to help us craft better prose. We need to practice honing the phrasing of our words until they shine. As a novelist, the basic program doesn’t understand the need for sentence fragments for pacing or dialogue syntax. For example, woulda used to expression a character’s speech pattern is underlined as misspelled. Overall it’s a great tool to keep your conscience mindful of your most common errors as you draft your copy. I’d recommend anyone who wants to improve the grammar areas of their writing to give the free download a try. I’ve installed it on FB as well. Everyone notices when a writer has a blaring typo. Haven’t decided if I want to purchase the advanced edition. That portion claims to catch errors on a deeper level. I would recommend checking out the free version. Have you used Grammarly? What do you think of it? Don’t forget to subscribe to this blog in the right -hand column. How many of you love gardening? Seeing your landscape creation take shape, watching the bulbs you painstakingly planted bloom in glorious, magnificent colors. Now, how many of you love weeding? Getting down on hands and knees and ripping out those menacing thistles, dandelions, grass, stray saplings, and (if you have a neighbor who feeds squirrels) corn stalks. Well, if we were in a gardeners class, I’d be the one hiding behind the big kid, hoping to avoid getting volunteered. I love a beautiful garden but hate, HATE weeding! The whole process makes my arms and shoulders ache and my fingernails acquire black French tips just thinking about it. Needless to say, my yard gets pretty weedy before it is attended to. Over the years, my landscaping has become pretty Spartan. A writer’s garden of words needs weeding, and that can become a pretty daunting task, too. Especially for the novice. It’s like sending a four-year-old into your flower beds to weed. They know not what to pull so they remove a lot of healthy foliage. If her eyes are green, don’t keep telling me her eyes are green. He gazed into her green eyes. Or, Her green eyes snapped. Maybe those eyes blaze like an emerald when she’s angry. Still green but more exciting. Her pupils grew large when the villain approached. See what I’m getting at? Does your hero fist his hands a lot? Or run them through his hair? (Mine sure did.) Flex fingers, white knuckles, clenched-fisted. 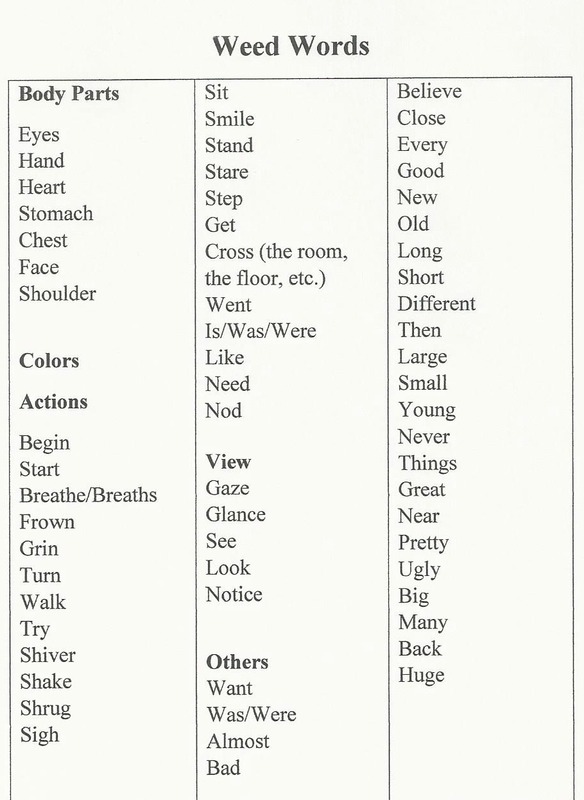 Find more interesting ways to refer to physical action. The thready sound of air passed through his teeth. A whisper of air tickled her neck. My editor found a lot of sipping going on in my novel. So we had to weed those sips out. My characters held the mug to their lips. Stirred the content. She gazed over the cup. Gulped, swallowed, savored and drank. Don’t walk across the room. Stride, skip, stomp, waltz, plod or any other action word. We use lots of was, were, is, are in our writing. She was sad might transform to sadness gripped her. If it gripped her heart in one paragraph be sure it travels to her toes or spills out her eyes later. Thistles end up in my yard and flowerbeds because of the Cardinal bird feeders in the neighborhood. When you think you’ve got them all, more pop up. Common words can become thistles. Just, only, have just, but, because, really, very and lots of -ly words. When a thistle blooms, it is lovely. It’s the national flower of Scotland. Most Americans don’t grow them intentionally. They are prickly and a nuisance when they pop up in random places. Do you recall listening to a speech sprinkled with the words: you know? Or have a friend end every sentence with –just saying. Make sure your word garden is free of those. Below is a list of words to weed from the landscape of your novel. Words that distract the reader. The passive word that slows the action. Perhaps a favorite go-to word planted between awesome words causing the scenes to droop. These words distract the reader from the beauty of the overall work. It is recommended by most authors I know to start your own list of words you habitually plant in your projects. Refer to your list when you begin editing. Get out your weeding tools and eliminate the majority of them. Thin others. Not every was is unneeded and an occasional just is just fine. Keep the list handy because those little buggers are going to reappear time and time again. And you will probably add to your list when you notice your replacement words become repetitive. What are some favorite words you use in excess in your writing? Subscribe to this blog in the right-hand column. Jesse James dressed in a Qunatrill’s Raider uniform. Today I thought I’d share a fun factoid I read while researching my novel. You can’t research the old west and not read about Jesse James. You may know he was an outlaw. He robbed banks for a living. He had been one of Quantrill’s Raiders before and during the Civil War. They were a group of men who attacked free-staters in Kansas. Free-staters were against slavery. Kansas was a territory being settled by those both for and against slavery. The settlers hoped to gain enough population with the same view on slavery in order to sway statehood votes in their direction. Quantrill’s men would burn out anti-slavery towns and murder their residents in hopes of making Kansas a slave state when it sought statehood. If not for the Civil War these men would have been arrested and hanged. But the confederacy recruited them. These murderous outlaws became a special guerrilla unit who wreaked havoc on many fronts in support of the war effort. I was surprised to see how many times Jesse had his picture taken. And yet people rarely identified him as the one who committed the crime. After the war, Jesse along with his brother Frank formed a gang and began their infamous adventures. The banks and trains the James -Younger gang robbed were believed to be owned by former union officers and other Yankees they felt wronged their family. The former soldiers were now part of the Republican Party and active in Reconstruction. They became the target of revenge for wrongs inflicted on the south. James Edwards, a newspaper reporter painted Jesse as a Robin Hood character. But there is no evidence that the gang ever shared their loot with any in need. Jesse James was eventually shot and killed in his home by Robert Ford. Ford, a member of Jesse’s own gang, wanted to claim the $5000 reward the railroad placed on James. When visiting Merrimac Caverns with my children years ago, we learned James and his gang hid out in the caverns. And it was believed they hid loot from robberies there, as well. The caverns are a dark and dangerous place and unless you are familiar with the tunnels you could get lost for days. While reading about Inns and how they accommodated travels during post-Civil War America a story was told about Jesses James. Theses Inns were no Holiday Inn. The large room had rows of cots and all the travelers shared the same space. The women might be housed in a separate room. The story goes, in order to escape capture after a bank robbery, Jesse disguised himself as a woman. He spent the night at a roadside Inn. The Innkeeper thought it odd that the woman insisted on sleeping with her valise. She would allow no one to even touch it. The discovery of the woman’s identity came after Jesse was long gone. I imagine the outlaw’s stay became a great draw for future guests. I found Jesse’s disguise as a fun addition to my own villain’s escape plan in my novel, Secrets and Charades. Because Evangeline left Missouri to go west, she feared robbery and mentions the James gang as having robbed the bank not too long before she headed west. Just a few tidbits of history from all the volumes of facts I learned to give a feel of place and time. What interesting factoid have you learned while researching for your book? Did you find it fascinating or fun? Did you add it to your story? Notice the diversity in these cowboys. I am a pantster, I write my stories as my characters speak to me. I don’t usually outline and sometimes characters appear I never met until the words appear on the page. During my research in preparation for my historical novel, I was fascinated by the various nationalities, who populated the geographic setting of my story. Because the information ruminated in the back of my mind, many minor characters took shape from those tomes. During the mid -1800s significant immigration by many diverse people groups to the unsettled regions of the Midwest occurred. African Americans came west after the Civil War. Former slaves looking to start new. Irish immigrants who’d help build the railroads and were sick of big city life in the East. Some who in order to gain citizenship fought in the Civil War on both sides. Chinese nationals helped build the railroad. Wikipedia places them only on the west coast. However, my resource books show they also moved inland. Not all Native Americans were on reservations either. And Mexicans were the first immigrants to the area under the Spanish flag. All of these nationalities took up residence either on the ranch or the surrounding community in my novel, Secrets and Charades. Irish immigrants. Notice the one in the union hat. Irish women took any job available. These washerwomen might have traveled west for a better life. My ancestors among them. immigrants. So, it would be appropriate to have Irish police officers in your novel set in this time period in New York. Those same poor, abused Irish immigrants came west as farmers, miners and the like. The various free land opportunities gave them a chance for a better life. Former slaves on their homestead. African Americans who had served during the Civil War also participated in homesteading opportunities. Former slaves with specific skills such as blacksmithing could make a living out west. Black communities sprung up throughout the west. The stigmatism leftover from slavery made it safer to form their own communities. Mexican vaqueros taught the American cowboy many things. Mexican-Americans from the rich to the poor had to make room for many settlers. The poor Hispanics found work on ranches. Non-Hispanic cowboys learned their skills from these experienced vaqueros. Often the household staff on large ranches were Hispanic. The Chinese usually create their own communities in a section of town. Their different dress, language, and culture put them under suspicion. Chinese were not permitted to bring their families with them. Although I don’t explore the seedier side of their communities in my novel, sadly there was one. Rather I chose to paint them with a more compassionate brush. Asians have been part of American culture for hundreds of years. Besides, a key scene in Secrets and Charades would be impossible without my Chinese characters. Native Americans were ever present in the old west. Not all lived on reservations. Their life was hard, abuse at the hands of the white man is well-documented. Still, there are accounts of Indians and mix-race families living peacefully with white neighbors. Knowing the culture of those who lived during the time you place your story can make the tale not only more believable but far more interesting to the reader. Don’t hesitate to add some color to your otherwise vanilla characters. Who are the characters that populate your story world? If you’d like to continue following me please feel free to sign up in the right-hand column. you will receive new posts in your email each week. In creating settings, a writer does a lot of research. Historicals require just enough information to help the reader see your story world but not too much to slow the story down. Housing from the era and geographical location can become the juxtaposition of a dramatic twist. While researching my novel I found the homes built on the prairie ingenious. This soddie looks thrown together. Because in some areas wood was hard to come by, the first homes were often soddies made from handcrafted blocks of dirt. These blocks were cut and placed on a frame. Up until the 1880s, sod bricks were cut from thick grasses with a shovel. With the invention of the grasshopper, a special plow designed to cut through the thick sod, the task went faster. It was not uncommon before this invention to build on a hillside using the hill as the back wall. Soddie built into a hill. If having shelter quicker was needed a dugout would serve. A hole dug in the side of a hill large enough to house the family could be constructed quickly. Either sod blocks or a wood frame covered the entrance. Both of these were intended to be temporary shelters. Soddies and dug-outs housed insects, snakes and other underground varmints in the walls. Lining the walls with wood or plaster helped create a barrier between crawly creatures and human inhabitants. A large rain could flood a dug-out or destroy a poorly constructed soddie. Once a proper cabin was built the soddie or dug-out were often repurposed as a storage area, a barn or quarters for either a newlywed eldest son and his wife or aging parents. Some soddies were so well-constructed they lasted for decades. Another throw together dwelling for new homesteaders might be a shanty. The walls were of thin wood covered in tar paper. The siding might be added after the first cash crop. They were drafty and did little to keep winter cold out. The floors were dirt and often windows were made of butcher paper rather than glass. Butcher paper (used to wrap fresh meat.) would be rubbed with lard and affixed to a window opening. You couldn’t see through it but some light came in through the greasy film. A real cabin might only be one room wooden structure with a sleeping loft. Much warmer than a shanty and far cleaner than either a soddie or dug-out. Windows might still be butcher paper unless the owner could afford glass. Often windows were made of many panes rather than one large sheet of glass. The small squares were more economical in case the window was damaged only the smaller broken portions need be replaced. In desert areas or flat plains homes were made of adobe. A special mixture of mud, the base being clay and sand and sometimes dung. Straw was added. One account I read mentioned horsehair. The mixture is poured into frames to create bricks. They were sundried. Adobe bricks have been used all over the world for thousands of years. And are still used as an economical way to construct a home in some areas of the world. They are sturdy and keep the homes relatively cool in summer and warm in winter. Whatever kind of home a pioneer built the interior walls were whitewashed as soon as possible. This gave a cleaner appearance and reflected light. The Double M ranch in Secrets and Charades is made from adobe bricks. Jake has a soddie on his ranch. It is used by his ranch hands if they are too far afield to make it back to the bunkhouse before dark. And his family’s original homestead is a cabin. Each of these locations is a crucial setting in the story. Even after all the research on their construction, I chose not to put that information in my novel. Too much description draws the reader out of the action. Evangeline’s observations of her new surroundings set the mood. Each structure plays a key in building the emotional tension between characters. Had I taken the time for Jake to explain how each structure was built you would be bored. Now, if they were building one of these structures together, the process becomes part of the emotional struggle the characters experience. What have you researched for your WIP to help create your story world? How much of that information do you feel really is necessary to use? Please share in the comments. Feel free to subscribe to Writer’s Patchwork to receive this blog in your email as new posts become available. See right-hand column.